Davis Law Group, P.S. has filed a civil lawsuit in King County Superior Court (19 2 00523 8 SEA) on behalf of a 70-year-old Seattle man who was walking when he was struck by a car with a frosty windshield which severely impacted the driver’s visibility. The pedestrian accident took place in January 2017 at about 7:30am in the Capitol Hill neighborhood at 15th Avenue E. and E. Roy Street. The accident victim had started to cross 15th Avenue when he was struck by a 2006 Ford Taurus. The victim was thrown up onto the hood of the vehicle and struck the passenger side mirror causing the mirror to be ripped off of the car. According to the Seattle Police Traffic Collision Report, the investigating officer interviewed the driver of the vehicle who stated, “he was in a hurry this morning and did not clear all of the frost off of his windshield…he only cleared a small hole and thought it was enough.” However, the driver said that he did not see the pedestrian until it was too late to avoid a collision. The officer reported that he could still see frost on the windshield minutes after the collision when police and first responders were on the scene. The driver of the vehicle was cited for Reckless Driving (SMC 11.56.120). The pedestrian accident victim was transported to Harborview Medical Center where he was treated for neck and back pain. He has required multiple medical procedures and physical therapy since the accident. The lawsuit (19-2-00523 8 SEA) claims that the defendant breached his duty to act reasonably by failing to operate his vehicle in a safe, careful and prudent manner. As a result of the defendant’s negligent conduct, plaintiff was injured, suffered, and continues to suffer, physical disability and pain, emotional trauma, medical expenses, and other damages. 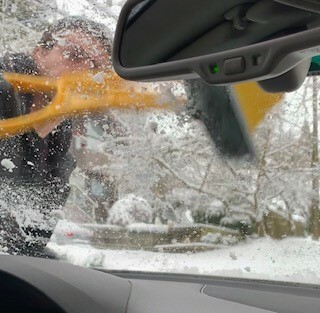 It is difficult to determine how often frosty windshields are factors in traffic accidents as the Washington State Traffic Safety Commission does not keep those statistics. Capital Hill neighborhood at 15th Avenue E. and E. Roy Street in Seattle.